Lest you happen not to be an expert in reading the insane architectural language of 1989, let me walk you through it. When you first walked in (in the SSE corner), there was the spiral staircase on your right and a built-in pink laminate storage unit to your left. You couldn't see them very well, however, because the whole area was closed in by a closet and a fake arch. Sunlight was mostly rumor. arch on the right, sofa back on the left. the stuff of dreams. Walk yourself through the fake columns, and you were… smack up against a wall. The whole building's windows are built very high into the exterior wall (sills begin at 5'), because the original building was a 1903 warehouse. The idea - not terrible in theory, mind you - was to build a platform for the living area that brought the windows to normal height, so the leftover space was a walkway that allowed you to access the strange coat closet and shuttle you along to the kitchen and bathroom, with the living area above you. Trouble was, the living area had a built-in sofa, and room for not much else. So you could sit on the groovy seat and stare at the wall. Standing in your little rabbit warren in front of the elegant tiny arch, the kitchen was to your left. It had a ceiling height of about 7', and an amazingly unnecessary single-unit oven/microwave/cooktop thing which looked like it came from Darth Vader's line from QVC. The sink was positioned juuuust right so that if you wanted to put down a hot pan or, I don't know, have some ingredients near your cooking surface, they would be inside the sink. No, no, you can't go behind you - that's where the too-deep fridge lives. Note also the convenient sprinkler pipe in the middle of the wall. Nothing worked. Across from the kitchen was a built-in spot for a groovy round table with a banquette, which gave us our majestic round stepped wall. This table was not a bad idea, again, but the wall was, for some reason, over a foot deep. There were some odd shelves built into the back of it, so maybe that accounted for the depth, but I'm not sure what you can put on a convex shelf. There were, of course, custom cut round mirrors on the tops of every wall step. I like to think that was a thoughtful touch for those of your guests who might have fallen over, but still wanted to do a discreet line of coke. Very considerate, this designer. go wash up, it's time for pancakes and amphetamines! you can just see the round wall there on the left, for orientation. so, basically, this is shoved in a corner. who wouldn't want to get clean in here? The bathroom was a reasonably inoffensive bathroom, except that it had a tub and shower, which seemed sort of odd when there was only one bedroom, on a different floor, which had its own full bath with an identical shower. There was no room for a guest bed downstairs. Who, precisely, did we imagine was using this shower? MIght you decide, in a fit of pique, that you had become overworked going up and down the steps to the sofa and needed to shower off immediately, on THIS floor? Were you inviting friends over to take bubble baths while you fired up the old microvenstove? At any rate, the brown raku-glazed tiles looked for all the world like someone had been sick on them, and the sink was at the correct height for a child. I mean that seriously - there are special child-height vanities. Neato-skeeto. They had a legitimately great linen closet by the bathroom, and a coat closet across from it that housed a washer/dryer unit which was 6" too deep for the spot. 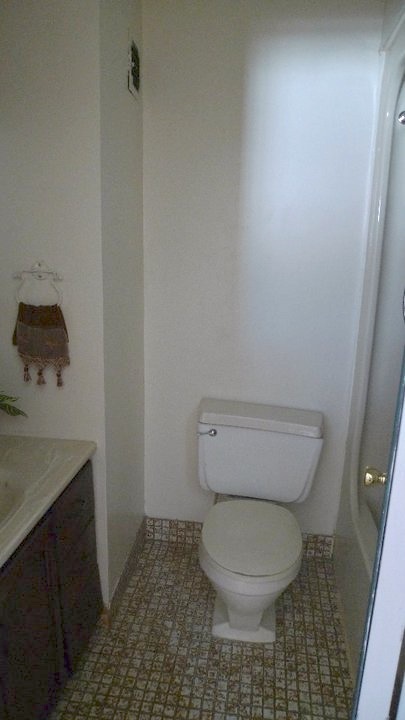 You could just barely open the bathroom door around it. those shelves seem to have a very specific purpose. but a secret one. The whole upper living area was… well, confusing. It was long and narrow, and you couldn't really fit decent furniture up there. So you had this great 800 sq. ft. room with a giant exposed brick wall and 13' ceilings and cool loft feel, and you could fit, like, one sofa and a small table in it. It made me sad. But also, schemey. It made my fingers do the Mr. Burns thing. Yesssss. Spaaaace planning. Very Gooooood. there's a password to get in. Then came the loft. There was an actual loft, which accounted for the lilliputian kitchen ceiling. The bathroom had this terrible ceiling height, too, because the loft stretched 13' long. It was, however, only 5' tall. I can't stand up in it, and I am a very average 5'5". 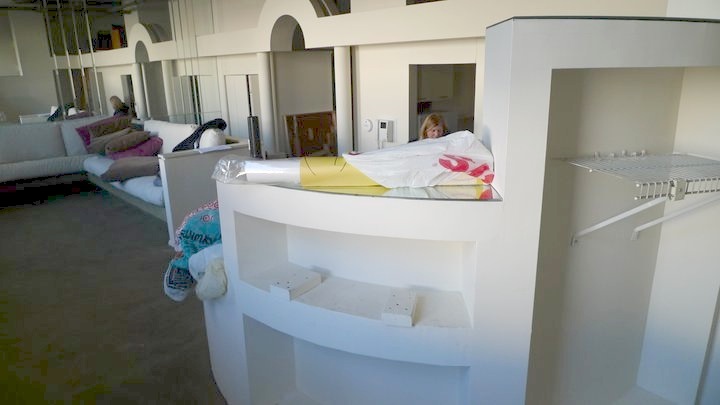 So you had a loft stretching for a quarter of the apartment that could basically only function as a storage area that you still had to look at all the time. You accessed the loft by a ladder, which had its own nifty little bookshelf nook surrounding it. I kind of liked the nook, actually. It increased the feeling that the loft was actually a panic room, and the ladder was your drawbridge that you could draw up behind you when your coked-up guests got rowdy because the shower line was too long. Fun side note: when we did the viewing, the loft was stuffed with the collections of the hoarder who the owner was letting squat in the apartment with his battery-powered lantern. Remember - no electricity for 6 years. Cozy!! The selling agent said she was regularly scheduling showings of the supposedly-vacant place and surprising this gentleman - comfortably in his 40s and looking like a totally normal person except for, you know, the hoarding and lantern and stuff - reading neighbors' magazines he had salvaged from the recycling bin. I imagined him working in a really normal office and none of his coworkers having any idea that he went 'home' to a furniture-less apartment and a stack of month-old L.L.Beans in a former coke palace. Ugh, that sounds incredibly sad. Poor hoarder guy. I hope he gets his own L.L.Beans now. He earned them. Sadness aside, at least we had a cool stair case. I have learned in the intervening years that spiral stairs are better in theory than in practice, as carrying laundry baskets up them is the worst. The worst. But also because our ceilings are so tall, our stair is extra-tall. it goes for a full turn more than your average one. BOOO. But it goes upstairs, and so shall we. On to the next post! If I find another money-pit house to lust after, you can be the first to know. It may not be shocking that my most frequently updated board is ‘OTT’ (over the top). Do I make boards for houses that I am never going to buy? Yes, yes I do.